'DOC' ia really doing well. We have been working this week on getting our cues and communication together. I have been trying to focus on the same signals you were using, and 'Doc" is getting used to me. 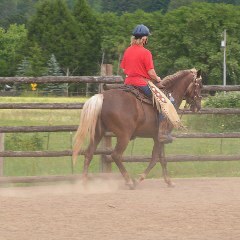 He is doing excellent hounch and forhand turns, and sidepasses every time and quite a bit of the time really pretty. 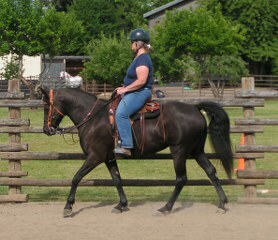 I am using what you tought me on the reins for turning, which is working really well. He turns with almost no rein pressure. He is stopping very well also. I am truly pleased. He has a lot of focus, and is letting me be his protecor and guide, even when he is nervous. Sunday night and we went to a clinic with six other horses in the arena and she was fantastic!!!! Truely wonderful!!! We just need to get her mouth and we will have a whole horse. 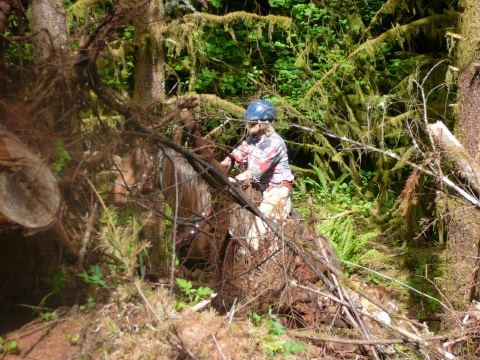 She did a trail course with backing through barrels opening gaits poles, plastic tarps, flags and plastic on a stick, she was totally awsome!!! She did nothing wrong, I'm still in love with her. You did a great job she just was having a bad day when I picked her up. Please see the attached article. I just fot home from a gaited horse clinic this weekend. She did great. She felt very solid but she did fuss a little in her "Whitney" stlye. A little check here and there to see if I was paying attention, Nice job, thank you! I was also pleasantly surprised at how soft Whitney's mouth was. Here I am at the clinic this weekend. I am doing some rail work. She is doing very well and I am so pleased! There were 5 other horses in the arena with me and she did great! 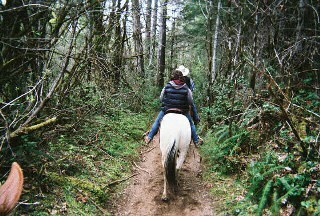 I can't wait to do some trail rides. Thank you so much for all the hard work that you put into my horses. You took such great care of them, I never worried a moment about their health or happiness. You did such and amazing job that I now trust Annie to not spook and take off on the trail, and I trust that Wrigley will take absolute care of any rider on his back. So far Annie has been enjoying the trail rides, she loves to go out with Wrigley and just explore and relax. Wrigley is learning about cows, this was day number two hanging out in the pen with them. I've attached some photos of us at a sorting practice tonight. I'm just so amazed that in 60 days you took my 2 year old colt who hadn't seen a saddle before, and now I am able to haul him and ride him in an arena with 20 other horses running around and he is just calm, relaxed and totally intent on listening to what I have to ask. Your an amazing trainer, you have a real knack for listening to what a horse is thinking and feeling. Thank you to all of your family for all their hard work, the love that you all put into your training really shows. My horses are proof of it! Thank you Don for your good eye for looking at what a horse needs, and a special thank you to Mike for putting so many miles on my horses. 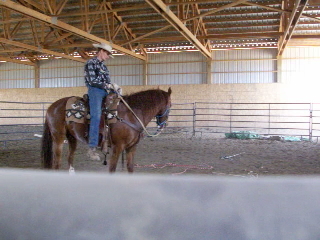 Your patience and confidence on horseback has made my horses calm, collected, and willing to do whatever I ask. Thank you for putting such quality training into China Doll. You put such a solid foundation on her. When I came and picked her up, you gave me a lesson on her, and helped me with her ques. 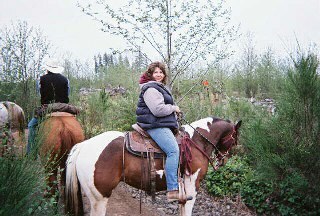 I was able to take her home and ride her on a trail ride with two other horse riders, she was if she had done it all her life. She did everything I asked of her. She gaits beautifully! Thanks for all your hard work! Wellafter we left the ranch that Friday we took her out on the trails in the Capital Forest, just Dave and I and she did wonderful even put her in front and she went right along, then the following Saturday we took her with a bunch of our friends to a 4-H fundraiser and she did good ( actually have some pictures that I will send to you of her on the trail), my friend was riding her mare(which has done trails for a year now) behind me and there was some trees planted in tires, her horse spooked gracie didn't. this last saturday we went on another fundraiser and she did well, not too crazy about horses coming up on her, but we're working on that. 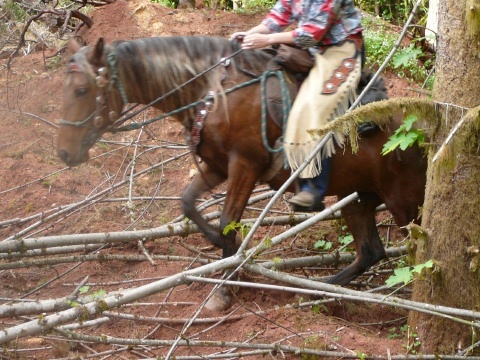 Sooner is doing good too, she's had two trail rides. We went on another trail ride the other day and everytime I ride her I'm getting more comfortable with her...you have taught her well. thanks to you and Mike for I think i'll have a wonderful ride for the next 20 years or so. I just wanted to thank you again for training Brandy for me. I know I'm not doing what I am supposed to do when it comes to riding her but I'm still enjoying her very much. I took her on her second trail ride yesterday. It was about 8 miles and she did terrific. I had her in the lead most of the time and she just walks out like an old broke trail horse. We only had one problem at a little wooden bridge that had water running under it. I let someone else show her it wouldn't hurt her and then the next one we came to she went first again. 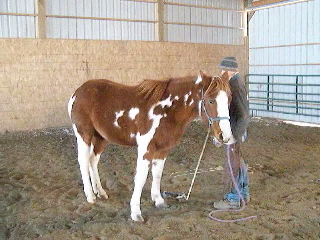 My biggest problem is going to be remembering that she is only a 2 year old green broke horse. Suz keeps reminding me though. She rode Beulah yesterday and she also did terrific. If I can continue to ride Brandy once in awhile I think she will become my favorite horse. I think I'm going to like her even better than her brother. 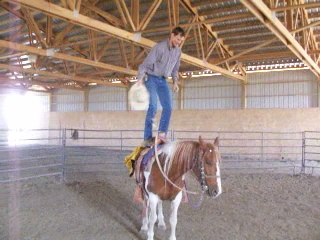 Thanks again for training my horse for me and doing such a good job. Well FINALLY, we are home safely. Just sat down at 9:15 pm. 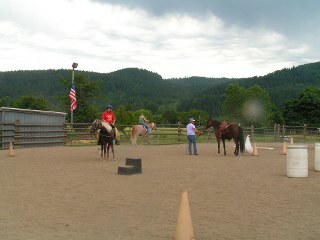 Took a detour to an arena in Eagle Point to let Tipsey out... and Heather and her friend Barbara ride her. Barbara did awesome with Tipsey. 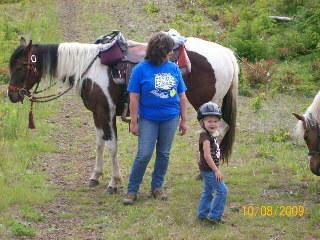 Heather rode Tipsey on a trail ride with 3-4 other horses. 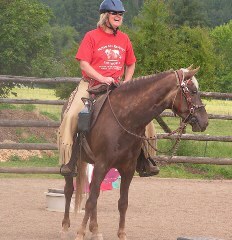 Barbara is gentle, patient and has only had 2 and 3 year old horses. She got a great response out of Tipsey! Tipsey trailered like a dream, didn't sweat up despite the long haul and curvey roads! Anyway, thank you Don and thank you Kandy and Katie and Mike and EVERYONE who helped, I am VERY pleased with the job you did with Tipsey! Don has helped me with my horse. He taught my horse how to do things I've never even heard of, and taught me how to stay on a horse and not get bucked off, he taught me how to lunge a horse too. 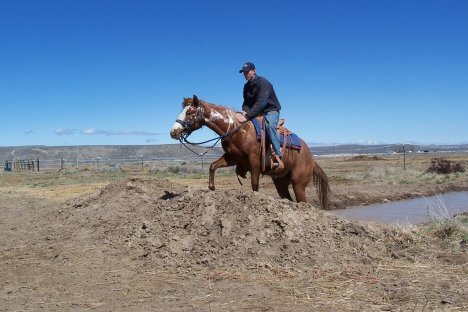 The time I spent with Don I learned more about patience and respect for my horse. I had a lot of fun learning new things and I know this knowledge will be put to good use as I continue to ride and become better. His help and coaching have been a lot of help to me and I hope other people will benefit from his teachings and guidence as I have. 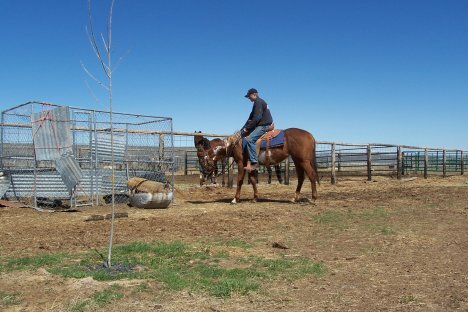 Because of a chance encounter with another of Don's satisfied clients, my wife and I decided to adopt two mustangs from the Burns BLM corrals, and have Don halter break them. We had adopted mustangs before but only very young ones and didn't feel we had the experience to train two more mature wild horses. My wife picked a gorgeous three year old, golden palomino and a week or two later I found a pretty blue roan filly about 18 months old for myself. 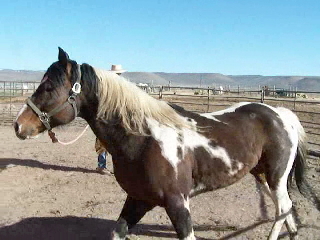 Both were transported to Whinny farms for training. Don did a fine job training the two mustangs, then showed great patience in showing us some of his tools to further their learning once they were brought home. Two days after we picked them up our horseshoer did some trimming on Magic's feet, due to a small tear on her hoof. Both I and the horseshoer appreciated Don's efforts. Magic hadn't met the horseshoer prior to this and behaved better than a good share of domestic horses. You couldn't have told him that her first positive human contact had been less than three weeks prior. Both Duchess, the palomino, and Magic are advancing quicker than either I or my wife expected. 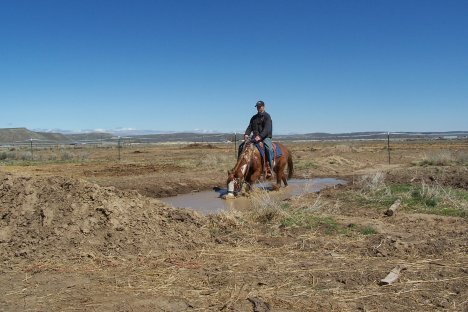 There are a lot of horse trainers that live closer to our home than Don does but we plan to bring both mustangs back to Whinny farms for their saddle training. 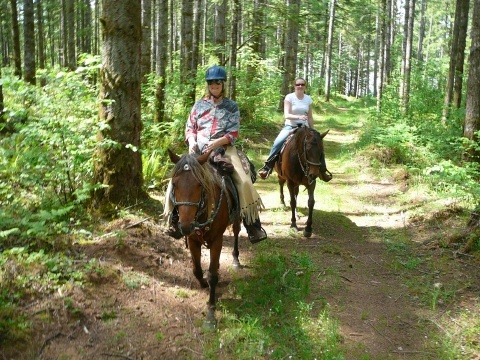 We have had bad experiences with different trainers in the past and the results we have seen with our two horse give us the confidence that if we put out the extra effort to drive the horses to Burns, Don and his family will put their best efforts into the education and well being of our horses.